We’re a new collective of some of the best Spanish, Italian and English speaking professional guides in Europe. Our guides share a love of history and culture, and a strong desire to give every visitor to our tours a great experience in Europe. Our company philosophy is simple: be the type of company our guides want to work with, and the best guides will choose to work with us. Our open and collaborative atmosphere encourages our guides to do what they do best: share their knowledge of the world to the world. 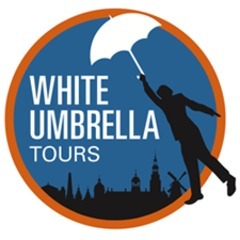 White Umbrella guides are a highly educated team of professional Spanish, Italian, and English speakers who share a love of history and culture and a strong desire to give every visitor a memorably unique experience. A good tour is both intelligent and fun. Some guides can do one or the other, but only the best can do both, every time. This is what we do and this is what distinguishes White Umbrella Tours from all the others.